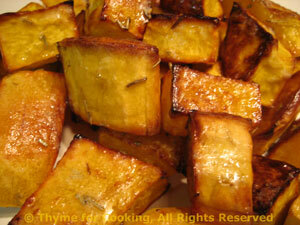 Roasted Butternut Squash with Rosemary, Thyme for Cooking easy sides. The white Balsamic vinegar emphasizes the sweetness of the squash and along with the rosemary, gives a lovely depth of flavor. Cut part of the squash into large bite-size chunks (1 X .5 X .5", 2.5 X 1 X 1 cm). Mix oil, vinegar and rosemary in a bowl. Spread squash on baking sheet and bake for 30 minutes, 400F (200C). Stir/flip once, after 15 minutes.